Claude-Achille Debussy (1862 – 1918) was a French composer. Along with Maurice Ravel, he was one of the most prominent figures working within the field of impressionist music, though he himself intensely disliked the term when applied to his compositions In France, he was made Chevalier of the Legion of Honour in 1903. A crucial figure in the transition to the modern era in Western music, he remains one of the most famous and influential of all composers. Beginning in the 1890s, Debussy developed his own musical language largely independent of Wagner's style, colored in part from the dreamy, sometimes morbid romanticism of the Symbolist Movement. Debussy became a frequent participant at Stéphane Mallarmé's Symbolist gatherings, where Wagnerism dominated the discussion. In contrast to the enormous works of Wagner and other late-romantic composers, however, around this time Debussy chose to write in smaller, more accessible forms. 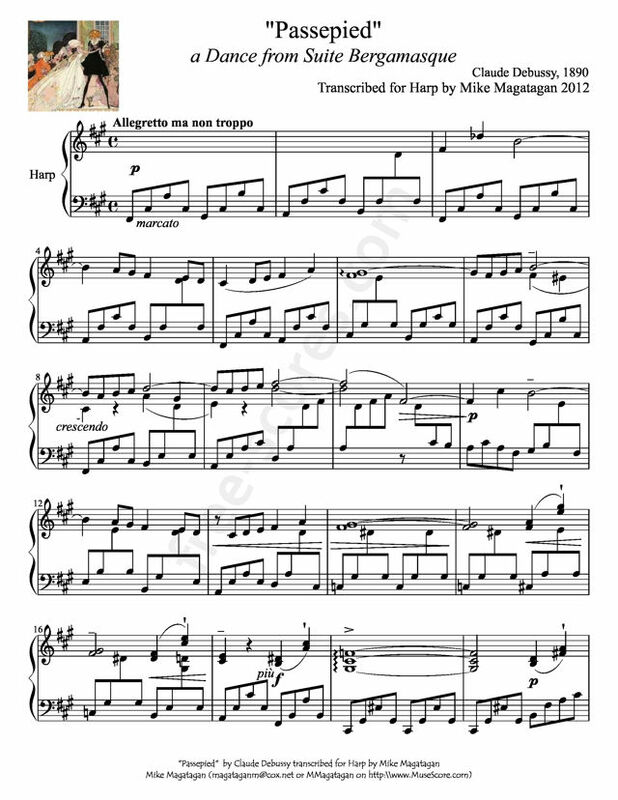 The Deux Arabesques is an example of one of Debussy's earliest works, already developing his musical language. Suite bergamasque (1890) recalls rococo decorousness with a modern cynicism and puzzlement. 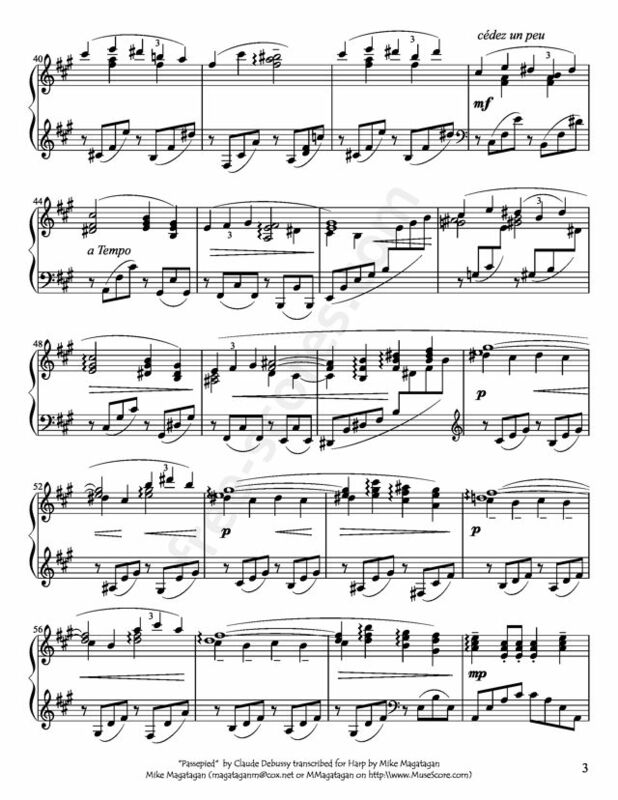 This suite contains (this) one of Debussy's most popular pieces, "Clair de Lune". The passepied is a 17th- and 18th-century dance that originated in Brittany. The term can also be used to describe the music to which a passepied is set. 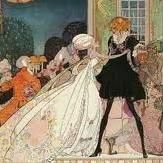 The music is an example of a dance movement in Baroque music and is almost always a movement in binary form with a fast tempo and a time signature of three quavers (eighth notes) per bar, each section beginning with an upbeat of a single quaver. 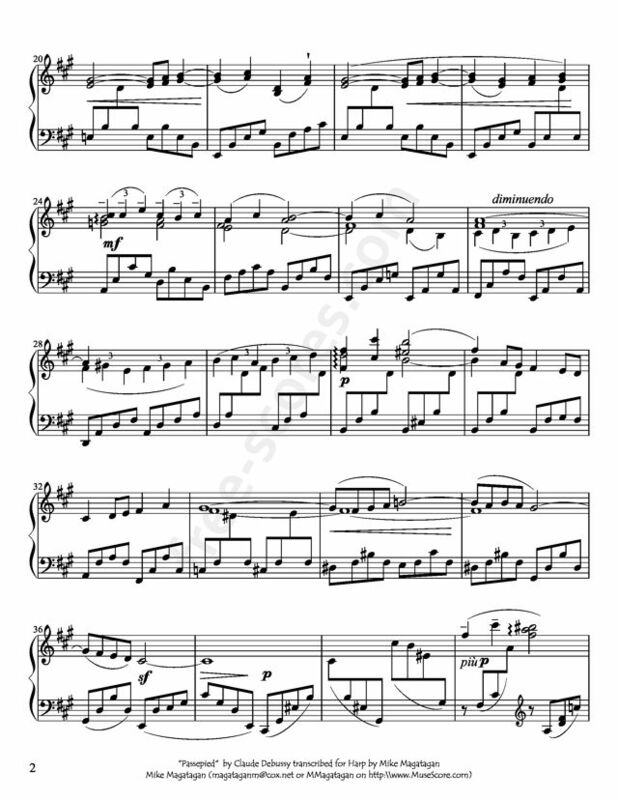 This work is a more modern example and is the fourth and final movement of Debussy's Suite bergamasque for piano. 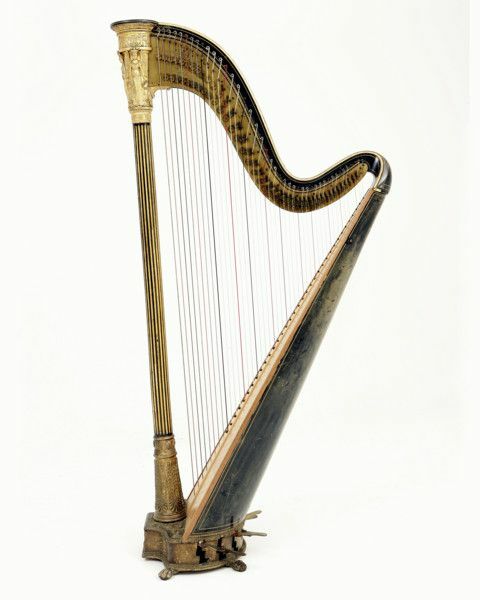 I created this arrangement for Concert (Pedal) Harp.